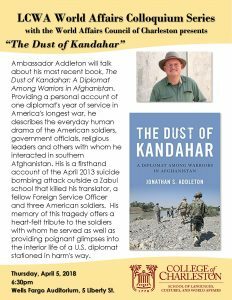 Ambassador Addleton will talk about his most recent book, The Dust of Kandahar: A Diplomat Among Warriors in Afghanistan. Providing a personal account of one diplomat’s year of service in America’s longest war, he describes the everyday human drama of the American soldiers, government officials, religious leaders and others with whom he interacted in southern Afghanistan. His is a firsthand account of the April 2013 suicide bombing attack outside a Zabul school that killed his translator, a fellow Foreign Service Officer and three American soldiers. His memory of this tragedy offers a heart-felt tribute to the soldiers with whom he served as well as providing poignant glimpses into the interior life of a U.S. diplomat stationed in harm’s way. This entry was posted in General Information by smithcn1. Bookmark the permalink.